First off, I wanted to thank everyone who’s been checking out my blog! I’m so excited to have some now followers, and I just wanted to welcome you guys! As I mentioned last time, pumpkin season is upon us! A few days ago my best friend called me and as we usually do, we discussed what we had recently been cooking and baking. I’ve been on a cake spree, since there’s been a bunch of birthdays recently, and she was making some pumpkin gingerbread bars. I of course immediately insisted that she share the recipe with me, because the sound of a pumpkin gingerbread bar sounded seriously amazing. I’ve been dreaming of making these since she told me about them, so today when I finally had some time I immediately got to it! How’s everyone doing? I’ve been quite busy this week with some birthday cakes I’ve been making for friends. One of the cakes I did this week was a Minecraft cake! I was asked to make a Minecraft themed cake, so I went with the actual Minecraft cake as my theme. If you’re interested on how to make your own Minecraft cake, follow the cut for my tutorial! So I’ll be the first to admit that I haven’t quite caught on to the Dr. Who craze going on yet, but my friends have definitely been trying to get me into it! Don’t worry guys, I’ll get there, I’ve just been busy! Just got back from a two week work trip, and I’m finally trying to catch up with some blogging! So what better way to start than with a Tardis cake? This cake was made for my friend’s son, for his 14th birthday : ). Honestly, I was quite concerned about making this cake because it seems rather daunting, since it’s rather detailed, but I’m never one to back out of a challenge, and honestly it wasn’t all that bad! So let’s start! I hope everyone had a great holiday! December was pretty crazy with all the birthdays and holidays, and January seems to be no different! One of my new year’s resolution is to blog at least once a week, so we’ll be starting the new year with a cute Pokemon themed birthday cake! Brian, who is one of my best friends celebrated his birthday on Sunday January 6th, and as he’s an avid fan of Pokemon, so his wife (also one of my best friends) and I decided we’d make him a Pokeball cake! Can you believe that Christmas has already passed us by!? I feel like the holidays were a whirlwind this year! I unfortunately haven’t had any time to do much baking, which was unfortunate, since I love baking during the holidays, but as my brother’s birthday as well as my own + Christmas all happened during this month, there was hardly a free moment! However, since it was my brother’s birthday as I mentioned earlier, I did make his birthday cake! I decided to go with a present theme, since I’ve always wanted to make one. It didn’t come out perfect (my frosting skills aren’t perfected yet), but I did think it came out pretty decent for my first try. So, during this entry, I’ll be walking you through making a very simple present cake! Earlier in the week I got back from a lovely cruise trip to the Bahamas. As it happened to be, one of my coworkers had just come back from his cruise to Mexico. I had asked him if he would be so kind as to bring me some Mexican vanilla extract, as it had been quite a few years since I had a chance to visit Mexico. 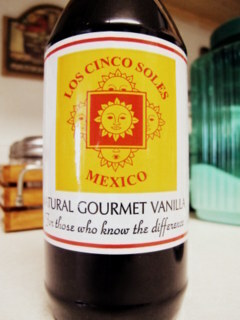 Upon his return he presented me with a very large 500 ml bottle of wonderful Mexican vanilla! If you’ve never tried different varieties of vanilla, I highly suggest it! It will seriously rock your baking world. There are so many types of vanilla out there, and all are great in their own way. However, I find that when purchasing vanilla at the grocery store you often get vanilla extract that has a bunch of ingredients listed. Pure Vanilla extract really should only have two ingredients: vanilla (or vanillin) and alcohol. Sometimes they will have water, and that’s ok too. There really shouldn’t be anything else in the ingredient list! Anyways, I was really excited to make something with my new Mexican vanilla extract. Just smelling it brought back memories of having pastries in South America, because they often tend to use Mexican vanilla extract in their baked goods. The smell is almost floral, and very very sweet. Ok. I’ll stop talking about vanilla… for now anyways, because I intend to do another post about it later since I’ve now been inspired to create my own vanilla! In order to test out my new lovely ingredient, I decided to make a quick and easy cake, the 1234 cake. One of the first cakes I ever made was when I was about 5 years old, and it was the 1234 cake. This cake is very simple, and one of the best cake recipes out there! Not only is it easy to remember, but it’s really the ideal cake base for any type of cake. I like this recipe because it delivers a cake that’s moist, spongy, yet firm enough that it could be used on a heavy duty cake being covered by fondant, or buttercream without caving in.